“Seventy weeks have been declared for your people and your holy city” the Lord tells Daniel the prophet. This message comes during a time of captivity, a time where Daniel’s people (the Jews) are out of the Promised Land and in the control of the Medo-Persian empire. Yet, even in these dark times, as Daniel prays and repents God gives him detailed information for what is to come: a time “to finish the transgression, to make an end of sin, to make atonement for iniquity, to bring in everlasting righteousness, to seal up vision and prophecy, and to anoint the most holy place.” (Dan. 9:24). Okay, big deal, right? We all dream of a day to come when good things will overtake the evil in this world. However, God’s word doesn’t stop there: “So you are to know and discern that from the issuing of a decree to restore and rebuild Jerusalem until Messiah the Prince, there will be seven weeks and sixty-two weeks…” (v. 25). Wait! Did you catch that? This goes quickly, so allow me to explain. In prophetic terms, these weeks refer to 7 year time periods. God first tells Daniel that there are 70 weeks, seventy periods of 7 years, that are important to the Jews. Now, I’ll let you in on a secret- that last week, the 70th week, is still to come. Many of the events I wrote about a few days ago are contained in that last week (wars, famines, etc). But those first 69 weeks are gone. Those 483 years have passed, but what does this mean? Why is it important to start counting out 483 years after the Jews are allowed to return home? What good can this possibly do? Here’s where the Bible goes from amazing to awesomely cool. Daniel’s people were only in the Babylonian captivity for 70 years. After 70 years, Cyrus sends out a decree allowing them to return to their land and rebuild Jerusalem (the city had been destroyed when Nebuchadnezzar took them into captivity). Had the Jews of the time heeded the prophecy given to Daniel, and had they started keeping track of the next 483 years, they would have know to the day when Jesus would enter Jerusalem on a donkey and start the Passion week. To the day. If that’s not awesome, I don’t know what is! They could have known beyond any doubt just from this that Jesus was Who He said He was- the Messiah, the Promised One, the Lamb of God Who takes away the sins of the world. So, today I take up the song and the cry of those crowds long ago, those few who recognized Jesus for Who He truly was, and I declare: “Hosanna! Blessed is He Who comes in the name of the Lord, even the King of Israel!” (Jn. 12:13). Last week I jumped the gun and posted a picture of my “pocketful of” Posy. 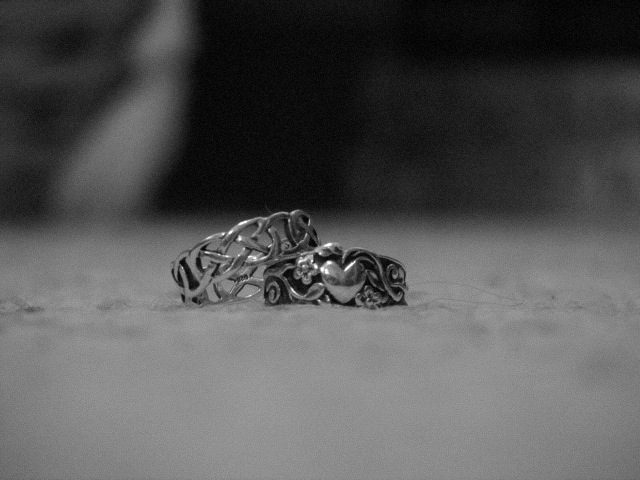 So this week, I have to post something about rings for Photo Friday. At least, that’s my excuse for posting this photo. The truth is that my laptop is currently on its way to Sony to have the fan fixed. Do you know the sound of ice in a blender? That’s what my laptop sounds like. It’s not good. Anyway, the laptop is gone, and with it all my current “artsy” pictures. However, I had this picture on my iPod so I emailed it to myself. There’s an existential activity for you! Boring intro aside, I do love this photo. The bottom ring was given to me by my parents when I turned 15. The top ring is one I found for myself when I turned 21. I wear them both everyday, and get lots of compliments on them both. The picture is a result of my playing around with the manual focus on my camera. The result, surprisingly, was a nice, sharp picture. The black and white effect only adds to the contrast. As usual, click on the picture to see it full size (you really want to do this!). Have a wonderful weekend! Today’s Photo Friday features my puppy. I named her Posy, after the littlest Fossil girl in the book Ballet Shoes. If you haven’t read the story, you should. It’s very sweet. 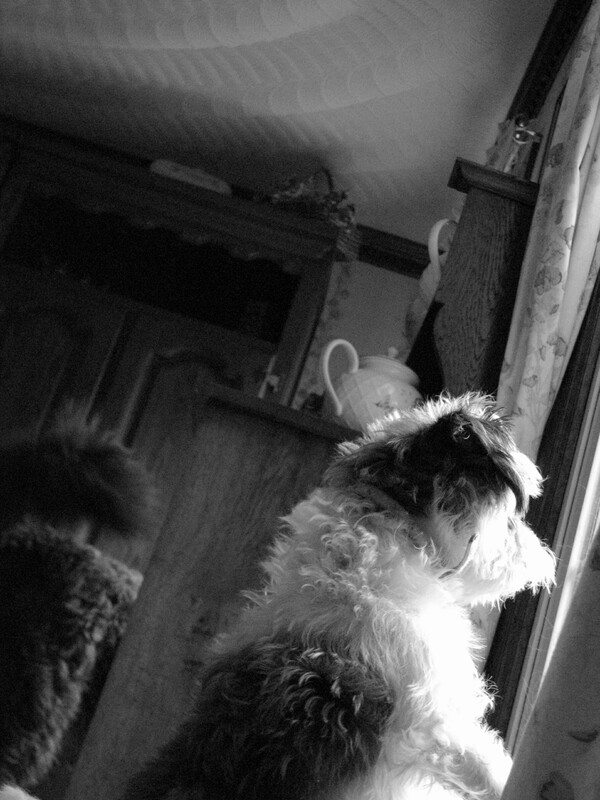 Anyway, the picture is of her looking out the window. She’s a terrier, so she likes to track squirrels- devotedly, focused, unendingly. Almost obsessively. But she’s a cutie, and I love watching her watch the squirrels. As always, click on the picture for the full size! Happy St. Patrick’s Day! For those of you who don’t know me, I claim an interest in this holiday based on my hair alone. (Think Riverdance type curls.) Driving snakes off the island is just a wonderful fringe benefit. The fact is that I love pretty much all things Irish. The excessive drinking is a little out of my line, but barring that…yeah, I love it all! Last Paddy’s day, Starbucks came out with a partner shirt that I flipped over. On it is a vintage shamrock and the words “Go Green” on a banner over it. It. Is. So. Cute. There’s not much more I can think to say about today. Wear green, talk with a brogue, drink responsibly, and enjoy some great music! I’ve included a few of my absolute favourite songs to get your shamrock parade started. I have this picture set as my iPod screensaver. I love the colour contrast, and the unusual flecks of orange on the flower itself. So there you have it! Feel free to leave any comments, or to tell me what kind of flower this is. 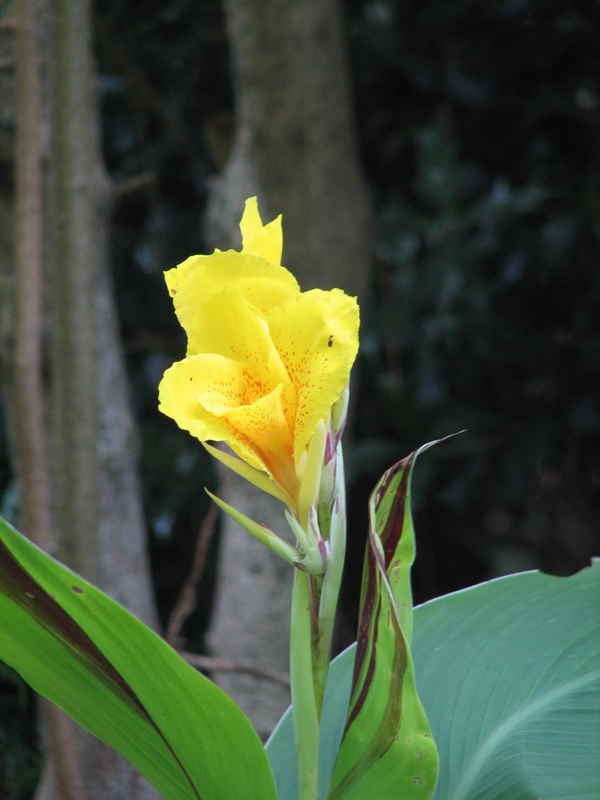 Update: with many, many thanks to John, this picture has now been identified as a Canna Lily. After extensive Google searching…erm, research, I concur!